I rarely just come right out & recommend a product or products by name brand, but I discovered something completely noninvasive that will help prevent blood clots in your legs while it makes you feel so "light on your feet" you might be compelled to go for a jog or a long walk! Also, I suspect, because of the improved physicality, it improves your mood and helps you to think more clearly, too. OK, don't laugh, eh? I'm talking about Anti-Embolism Stockings...T.E.D. 's & TruForm are the brands I tried. Yeah yeah yeah... I hear the internal dialogue, but before you say "Fa'getta 'bout it," please just listen to the simple physics and practical biology behind my apparently "outrageous" claims. As well, at the end of this paper I recommend some good clot preventing nutritional supplements. Anyway, these very tight stockings -tight but not uncomfortable the wearer comes to find- will push the blood away from the surface thereby preventing ugly and painful varicose veins! Additionally, it pushes the blood up and out of your lower extremities. See, reader? These tight stockings won't let the blood pool in your feet and lower legs! I remind the reader that such can result in painfully dangerous blood-clots anywhere up the leg, eh? This deep vein thrombosis (DVT), like the classic "airline-seat-for-10-hours-behind-the-knee-blood-clot-scenario" can happen also as a result of sitting at a computer for 8 or 10 hours! It can EASILY kill you if a piece of that clot breaks off and goes to your heart, lungs or brain... besides, nobody wants unsightly Faux-Cankles! These are of course Fat "looking" ankles from being swollen with fluid - not fat. T.E.D. 's helps with those, too. This increased blood flow in your legs and every place else prevents clots while it squeezes the blood from the lower body upward into your upper body and even the BRAIN. This is the exact same principle -to keep blood from "pooling"- as a fighter-pilot's "G" suit. This is the suit, remember, squeezing the lower half of the pilots body in a high "G" turn so as to keep blood pushed up into the brain and precluding a black out. Now, preventing blood clots in your legs can save your life or prevent a stroke, but the real thing that motivates me to wear them everyday is something that is palpable - you can't "feel" blood clots NOT forming, of course... but you can, and do, feel "light on your feet" with a spring in your step instead of that feeling like you're just dragging your tired ol' legs around. This "bouncy" feeling is because you actually are "lighter in the legs"! Since these stockings are tight at the bottom and get looser as they go up, this encourages the blood out of your legs, as we've said, making them feel noticeably lighter. This whole process increases overall blood flow, too, which increases oxygenation, prevents clots, and likely makes the wearer think more clearly, too, I suspect. I'm 64 and even though I work out daily I spend about half my life sitting at a computer. I noticed the last few years that most days I felt heaviness in my legs when I walked but I just attributed it to old age... until I tried Anti-Embolism stockings. They really make a difference. No hyperbole here! If you are over 40, maybe a little overweight, don't exercise much and you eat vascular-inflammation causing sugar and flour... I would recommend you take preemptive measures and help protect yourself from clots and the pain of those unsightly varicose veins. Believe me Folks, the "feeling light on you feet" will translate to actually getting up and exercising more - which makes your heart stronger, improves circulation and prevents the very clots that you wore the T.E.D. 's for in the first place! If you have other risk factors like smoking then it is absolutely imperative that you be proactive... especially when T.E.D.s are completely NON-invasive - well, except your wallet, maybe. They are about $20 to $30 a pair for the Thigh High length... but that is pretty cheap insurance, still! Concordantly, they make a shorter Knee-length also...in fact you might even try the knee-length first. They work on the same principle and even though they don't cover the back of the knee they still help prevent clots in that location. They would stay up & in place much better, where the thigh-length might need tugging back in place occasionally depending on your job or activity. The non-caring pragmatic can use garters even... I have to draw the line at those myself for some reason [cough], but they're a method, still. In the round, if you have never had a clot in your leg and you are sorta-kinda physically fit... then there is likely no reason to hassle with the "Thigh-length" style, anyway, BUT it is just good insurance to use the "Knee-length" style just because they are comfortable and don't ride down as you boogie around. Case in point: A slightly overweight cashier at Walmart who I talk to regularly was complaining about her painful varicose veins, a result of standing all day. She'd been told she might be suffering from poor circulation in her legs. I convinced her to be proactive and take home some cheap Wally-World fish oil & lecithin - and then order some of the "Firm" (20 to 30mm of pressure) TruForm "Knee-length" stockings. These really squeeze those ankles and calves unlike the slightly weaker TED's at about 15 to 20mm. TruForm & some other brands also make an Extra-Firm (30 to 40mm) which are really tight - don't bother with those unless you have a reason & know what you're doing. Anyway, she was genuinely amazed at how they improved her pain, energy, and even her mood. Your bells should be going off, reader. OK I guess I'm supposed to be very conscientious and tell you to go to a "professional," get measured for T.E.D. 's for correct fit and pressure... and that might a good idea... only there are easy to follow instructions on the pack or the various websites. With a couple of easy measurements you can find the one for you without any costly outside help. Moreover, they are purchased without prescription, eh? BTW, there are several different brands that I'm sure are also very good but T.E.D. 's & TruForm are the only brands I've tried. I liked them both. "WARNING"... the stockings are CONTRAINDICATED for people with severe vascular disease, massive swelling of the leg or fluid in the lungs from congestive heart failure... or a leg deformity. If you're not sure, see a professional! Changing gears, let's talk those nutritional supplements facilitating good blood flow & density that I alluded to at the start. (1).. Krill Oil Or Fish Oil -- Take 2 to 8 grams daily in divided doses right after a meal. Mother-Nature's most powerful way to reduce Inflammation, PLATELET-STICKINESS, Blood Pressure, Allergic reactions & it protects you from Dementia like Alzheimer's. Fish oil, remember, is also why those Inuit (Eskimos) maintain their "Woodiness" and keep rubbing noses right to the end. FYI : Mini Fish-Oil Tutorial - I'm not crazy about Walmart fish oil, that I alluded to earlier, because they only sell "Regular-Potency" fish oil where there is only 300mg of the desired Omega-3's (EPA & DHA) per 1000mg of fish oil. I recommend "Hi-Potency" oil where each 1gram (1000mg) soft-gel contains 500mg of EPA & DHA...some even have 600mg per gram. FYI! Something I encounter ALL THE TIME! Always remember to convert Medicinal Oil numbers to the common amount of 1000mg or 1gram to compare EPA & DHA because krill & fish oil soft gels come in many sizes - 300mg, 500mg (1/2gram), 1000mg (1gram) & the one that creates all the confusion is the 1200mg soft gel that people ALWAYS inadvertently compare to the smaller, more common size of 1000mg or 1 gram. Anyway, the Reg-Potency comes from bigger fish from warmer water (like salmon or tuna)... Hi-Potency comes from smaller fish from colder water (like anchovy & sardines). So colder & smaller is better, plus it also equates to less toxins which increase as you get bigger & climb up the food-chain...so never eat shark, by the way. (2).. Vitamin E -- Take 400iu to 800iu of "Mixed Tocopherol" or "d" alpha Tocopherol... NEVER take "dl" alpha. (3).. Nattokinase or Nattozime -- Enzyme that Improves circulation...comes from the famous fermented health food, Natto, used forever in Japan. (4).. Lecithin -- A natural Clot preventer & might even help dissolve clots that are formed. Take 800 to 1200mg of Soy or Egg Lecithin before each fat-containing meal. (5).. Turmeric or Curcumin (yellow stuff in curry) -- Take double dose 2 or 3 times daily without food or with food if it bothers you taking it on an empty stomach...you can also buy it in the powdered form for cooking. Big doses for a long time can cause temporary indigestion & mild stomach distress in a small number of folks. (6).. Ginkgo Biloba - Increases blood-flow so it helps prevent clots & is good for "MAINTAINING" memory...this stuff is so cheap that you should get the most concentrated, purest form - liquid extract in the tiny 1fl.oz bottles. A "dropper" full goes great in the next blood-thinner on the list - green tea. Oh, and reader: Don't pay any attention to the bogus (embarrassingly silly) study that came out a few years ago -proffered by sociopaths with a presumed ax to grind- saying that Ginkgo Biloba did not help with memory... I don't want to waste time here explaining why the alleged "study" was just profoundly dopey, but if you are really interested, let me know and I'll tell you about it. (7).. Green Tea - Not only thins your blood but contains several powerful antioxidants. If you don't like to drink green tea you can also get it in the concentrated liquid extract form. Many Liquid Extract brands have alcohol in them but most herbs also come "Alcohol-Free". Also, all you cheeky Brits need to get it "sorted," eh? Stop using milk in your tea - a glycoprotein in milk binds to the antioxidants rendering tea to just another unhealthful beverage...OK, maybe "unhealthful" is too strong. 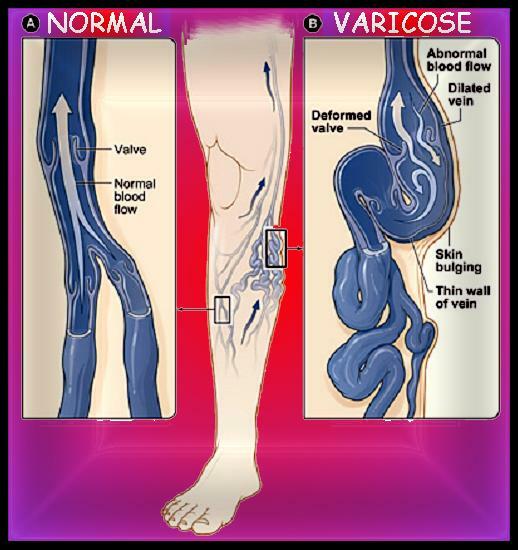 Folks, please don't blow these T.E.D.s off if you are even close to being in that group outlined above, a person who might develop a clot or varicose veins... come on, you know who you are. Don't let your Cognitive Dissonance kill you, eh?